The first episode of the new season is online. The road trips at the beginning are gone (thankfully). I expected there to be more focus on hand tools but the very first tool used is a benchtop mortiser followed by a tablesaw. Sound quality is excellent, lighting and camera angles are excellent, video resolution is low. I like that he jumps right into the project without spending 1/3 the episode milling stock or explaining safety. New sponsors include SCM and Felder. Fine Woodworking has become a partner so of course the first project is a Shaker table. Thanks. I just watched the episode where he built a Shaker table. One question: he used screws to attach the top which was made up of two boards glued together. With screws holding the top all around its perimeter would it be unable to expand and shrink and eventually just crack? -- Marshall --------------------------- In with 10. Out with 10. It’s a pretty narrow table, so probably not a big deal compared to a 40” wide dining table. He may have drilled oversized holes and they just didn’t mention it. The show looks good with great video work too. I try to do it another way if I can. Looks pretty good. Do you know if these are going to be on TV? Looks good. I like his style, and the hybrid approach. The irony of replacing One T Mac with T Mc is inescapable. Is that recorded in the same studio? Is that why Tommy moved out? The SCM table saw and Felder bandsaw are definitely not hobby tools, but he demonstrates using them in a familiar way: sled on the slider and shop made tennon and taper jigs. I cringed a little when he free handed the 45s on the tennons. wrenchhead, it’s broadcast early saturday morning on public television in my neck of the woods. Woodknack, have you heard why he was fired? I know I found his shows lacked the detail of New Yankee Workshop, but comparing anyone to Norm is not fair. I like a little bit of a road trip from time to time, to get some perspective on the project, but maybe Tommy over did it. It’s not airing here yet but check your local PBS station. Thanks for the info, will follow up. Hopefully this is readable. This forum uses a lot of compression. Most of you know that Tommy MacDonald was fired from Rough Cut and Tom McLaughlin was hired as his replacement. The first episode of the new season is online. The road trips at the beginning are gone (thankfully). I expected there to be more focus on hand tools but the very first tool used is a benchtop mortiser followed by a tablesaw. Sound quality is excellent, lighting and camera angles are excellent, video resolution is low. I like that he jumps right into the project without spending 1/3 the episode milling stock or explaining safety. New sponsors include SCM and Felder. Where is the source that say Tommy Mac was fired? Yeah, I’ve searched around and haven’t found anything definitive that says he was fired. Sounds more like just a parting of ways. 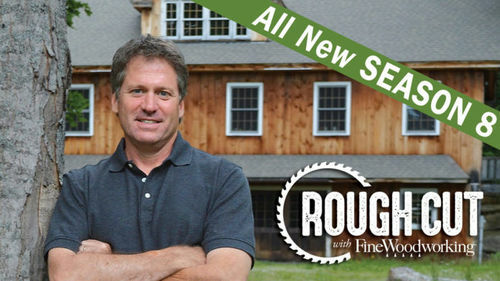 The first new Rough Cut didn’t really impress me. The curved front cabinet was pretty impressive though. I’m still put off by those tools like that Felder saw that I’ll never own. I’m not a huge fan of the host either, but I wasn’t a Tommy Mac fan either. 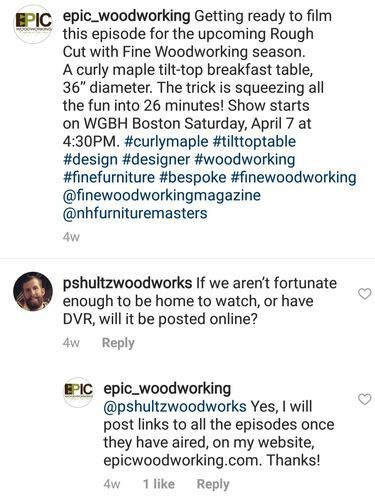 The old Woodworks show with David Marks was more my style.